I will post the last of the stitches from Found Poetry next week, after I have found or caught a wave! The stitch is Crest of the Wave - a beautiful old shetland stitch that I have used often - coming soon. Well I like writing and taking pictures. I like knitting too - but now that patterns are more give-aways than actual collections to "sell," I am dyeing more yarn than knitting with it. It's a lot about the times and how they have changed. Here is my first photo in the August scavenger hunt. One of the headings is "still." This is what I posted. Scavenger hunt - "still." My book store is still there and it was still open at 8:30 tonight, so that we could still walk there for a little "free" entertainment. - OK we bought $35.00 worth of books. 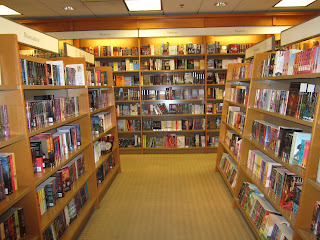 But I could still thumb through the books and look at titles and authors beside each other. I'm sure I'll love electronic books on an I Phone or I Pad. I never really missed the fact that there were horse drawn vehicles before there were cars or story tellers before there were books....but that still small voice grieves for what is lost even though much has been gained - maybe!! 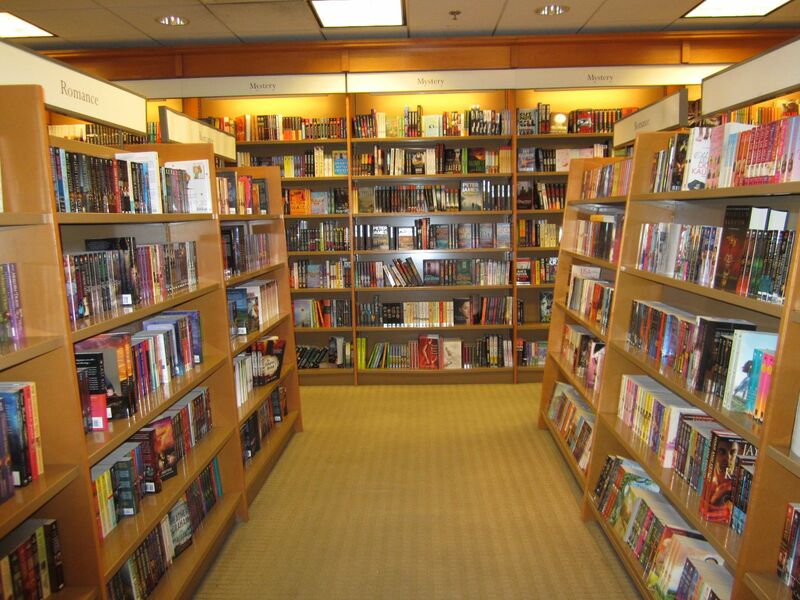 There was/is something very quiet about book stores and libraries. They often reminded me of church. You entered with hushed voices and you were reverent. You respected other people's silence, their mental occupation and you respected the books - the tomes that spoke to you without speaking, that begged to be opened and thumbed and maybe even read. There was a certain immenseness about "book houses." Yes, there were the actual physical books; but there were also the stories that they told, the information they held, the stimulating ideas they engendered. They were housed in grand buildings with beautiful windows and aesthetic decor. They raised the spirits along with the imagination. I will miss you when you are gone. Since I'm right at this moment sitting at the library (on my break from work! ), I was drawn to your picture. Ours is no longer a quiet sanctuary, but a happening community spot.